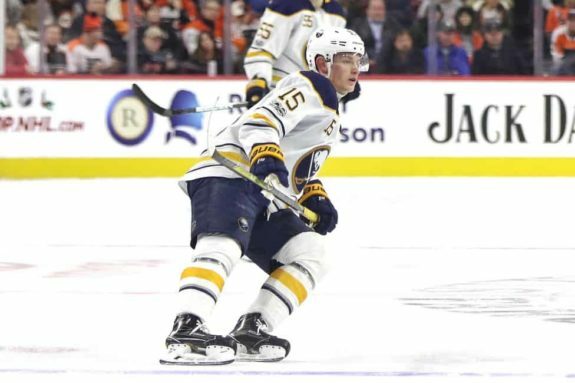 To say that the Buffalo Sabres require a lot of change and a lot of work to become a competitive playoff team isn’t too much different from saying that a fifth-grader in remedial English requires a lot of change and a lot of work to become a Harvard graduate. Sophomore general manager Jason Botterill promised sweeping change born of his frustration with finishing dead last in the 2017-18 standings. So far, he’s been good on his word – there have been trades, a quality draft, and a push to strengthen the organization from the bottom up. One of the most interesting stories to follow this year will be how quickly and pervasive Botterill’s plan for change includes dumping marginal players–sometimes veterans with million-dollar contracts–in favor of talented, spirited youngsters. Training camp for the 2018-19 season began on Sept. 13 in Buffalo. Players reported for closed-door physicals and testing. Going into camp, conservatively, of the 12 forward positions, 10 are filled. Of the traditional eight spots on the blue line, all eight seem to be claimed, at least for the start of the season. As are the two spots in the goal crease. But so far Botterill’s aggressive plan for success hasn’t been conservative. Frustration with under-performing veterans and dissatisfaction with prospects who haven’t developed or panned out have come to a head. Re-creating the team with new personnel is the primary way that change will occur that will lead to success. This means that as many as five forward positions and three defense spots are up for grabs this season and almost twice that number long-term. From here on out, players will hit the ice competing for roster spots. Players will determine the future of the roster’s composition. Botterill has a track record of favoring players who have come through the collegiate system, especially as team captains. He also favors players who have lined up against men in European leagues over those who have come through the junior hockey ranks. 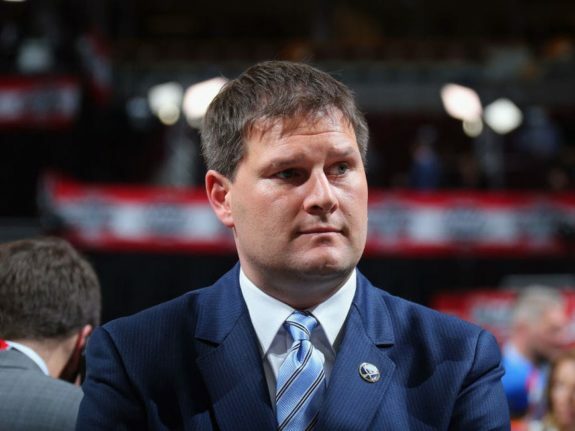 Botterill has determined the requirements needed for Sabres’ success; it is up to the players to meet these needs. If they can’t, the direction to the exits will be clearly indicated. Using this method, Botterill will let the roster sort itself out; he is relieved from making all but the hardest decisions. The Sabres are Jack Eichel’s team. Even with his 22nd birthday arriving just before Halloween, he is the team’s best player and highest paid player. Eichel is the current and future face of the franchise. Behind Eichel on the depth chart, little is absolutely certain. Newly acquired Jeff Skinner and Connor Sheary have been brought in to increase last season’s meager team goal total of 198 regulation time goals. Samson Reinhart, who finished last season with 37 points in the final 37 games is still unsigned but does seem to be part of Botterill’s long-term plan. There are 16 players coming to training camp who are listed as centers, 29 as forwards. Casey Mittelstadt, who was playing high school hockey not too long ago, is penciled in right behind Eichel. The 19-year-old comes into camp noticeably stronger than ever and brimming with confidence. In the recently concluded Prospects Challenge held at HarborCenter, he played well positionally and found some chemistry with Alexander Nylander. Both his youth and confidence were on display as he frequently tried to dance through the entire opposition. In his rookie campaign, he’ll have to adjust to playing at a much higher level than he has previously faced. Mittelstadt will be a fixture wearing blue and gold for a long time to come. Evan Rodrigues led the team in points-per-60 at even strength (2.06 in 48 games). He has a cap hit of just $650,000 and is under contract through the end of the year. The 25-year-old was almost a point-per-game player at Boston University before fighting his way up through Rochester. He’ll need a new contract but should be a bargain and therefore has a future in Buffalo. Twenty-year-old Tage Thompson, at 6-foot-5, has an enormous wingspan and uses it to his advantage. The first-round pick acquired in trade from St. Louis had a 41-game cup of coffee in the NHL last season after two years at the University of Connecticut. He has two years left on his entry-level contract. He will be given a chance to land in the top nine, if not the top six forward spots. Rasmus Asplund, selected 33rd overall by the Sabres in 2016, will make it hard for Botterill to ignore him. After four years of consistent scoring and quality defensive play against men in the Swedish League, Asplund was the unofficial unanimous MVP of the Prospects Challenge. He scored six points while demonstrating his speed, smarts and tenacious play. At just 20 years of age with a contract under $900,000, he is exactly what Botterill’s plan seeks. German-born Daniel O’Regan who came over from San Jose was the AHL Rookie of the Year in 2016-17. That followed a solid career at Boston University in which he scored 66 goals and 154 points in 154 games. At 24 years of age, with a cap hit of about $900,000, he’s likely to start with the Rochester Americans, but could get a look early in the year. Notre Dame standout Andrew Oglevie will compete for a place in the big league. Another 23-year-old with a cap hit of just over $900,000, Oglevie lit the lamp 36 times and scored 80 points in his final 76 games for the Irish. He’ll get a look in training camp and may be part of the team’s future. Sean Malone is a local favorite, having scored 117 points in 54 games at the Nichols School. After four years at center for Harvard, scoring almost a point per game, he will be given opportunities to prove he can advance. Currently under contract for almost $900,000, the 23-year-old West Seneca native has outperformed his sixth-round draft position and has nothing but upside. Victor Olofsson, a Swede who was a 2014 seventh-round pick, demonstrated his excellent shot in the Prospects Challenge. At just 23, Olofsson has a plethora of consistent years of scoring that the Sabres expect to continue after he adjusts to the North American game. C.J. Smith, an All-Star as a rookie in the AHL last year, is under contract through the end of the season. The undrafted UMass-Lowell scoring machine is just 23 years old. His determination is exactly what Botterill’s locker room mentality represents, helping him earn his latest contract. Kyle Okposo is a gentleman and well-liked by all. But, the 30-year-old, 11-year veteran has only scored 34 goals and 89 points in the last two years. It’s been five years since he has scored more than 22 goals in a season. And he carries a cap hit of $6 million. 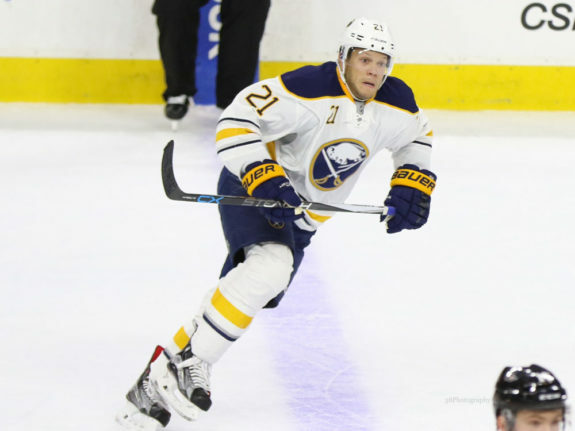 The Sabres will have to see Okposo eclipse the 25-goal mark if he is to have any future in Western New York. At the end of this season, he’ll be on the wrong side of 30 with four more years under this anchor of a contract. This is his last chance to show that Botterill shouldn’t find a way to trade him or let him go. Patrik Berglund will likely be the third line center on opening day this year. Coming over from St. Louis in the Ryan O’Reilly trade, Berglund brings modest scoring, respectable defensive play, and reasonably good analytic numbers. He’s versatile and slightly above average at many facets of the game. He’s also 30 years old with a cap hit of almost $4 million per year. As much as his veteran leadership may be valued now, he will be 34 when his contract expires. Those numbers don’t mix well with Botterill’s long-term plan. The organization had high hopes for Alexander Nylander when he was drafted eighth overall in the first round back in 2016. He’s beginning his third year with the Sabres and is slated to make about $900,000 for the next three seasons. This season, he came into camp in good shape and a with a positive attitude. He collected two assists in the Sabres first preseason game and played well next to Casey Mittelstadt in the Prospects Challenge. That said, to date he has done nothing to show that he was worthy of a first-round pick. He’s struggled just to show that he belongs in Rochester. Because of the term of his contract, he has some time to develop, but patience is wearing thin. Nylander sets up Beaulieu for his 2nd ? of the night. The population of Pominville is likely to grow by about 15 this year. And then abruptly cease to increase. 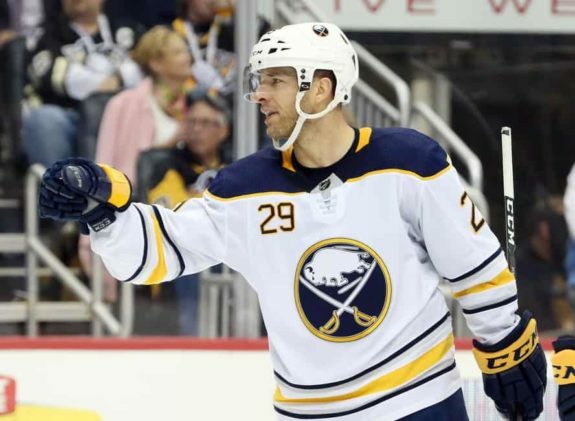 The Quebec native and former Sabres Captain is in his final year of a huge contract that will see him pocket $5.6 million. The 15-year veteran is good with the media and brings some leadership and experience to the locker room. And those are the words used to describe a great guy who has very little left in the tank. This is not an exception. Vladimir Sobotka, the 31-year-old Czech, was a piece of the Ryan O’Reilly deal. In his nine NHL seasons, last year was the first that he hit double digits in goals at 11. His cap hit is $3.5 million and nothing that he brings to the ice justifies that sum. The left winger is under contract through the end of next season. He will be fortunate to remain in the league, let alone a Sabre, that long. Returning Johan Larsson, at 26, should be in his prime. He has a cap hit of $1.5 million that runs through the end of this year. 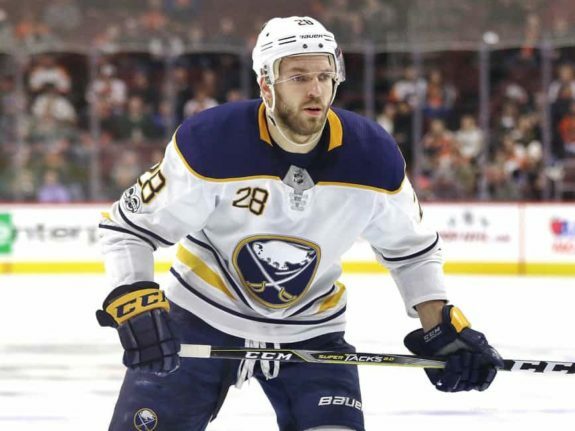 In his five seasons with the Sabres, he has struggled to score a whopping total of 26 goals and register a plus/minus of minus-41. Unquestionably, if Botterill is to give him a place in the line-up, this will be his last and best chance not only to stay on the team, but to stay in the league. “Latvian Locomotive” Zemgus Girgensons is a steam engine in a mag-lev world. Approaching 25 years old, he should be peaking. But, in his 348 games wearing a Sabres jersey, he has a paltry 44 goals and has matched Larsson’s minus-41 rating. He does not have the prowess in the face-off circle or the defensive chops to make up for his woeful offensive performance. Under contract through the end of this season with a cap hit of $1.6 million, the pressure he must feel is probably overwhelming. As with Larsson, Botterill is unlikely to have much confidence in him and therefore he will be lucky to be granted one last chance to demonstrate some value. 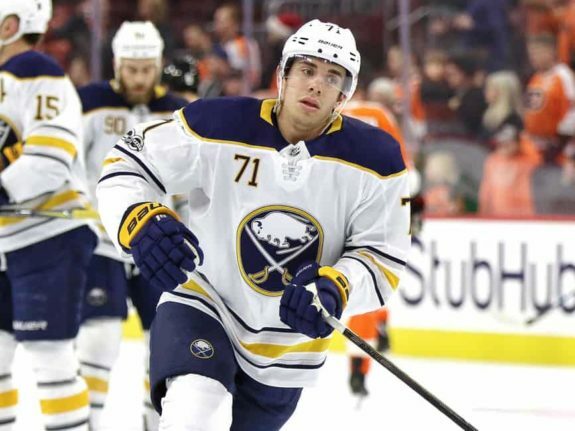 Justin Bailey (eight points in 52 games) and Nicholas Baptiste (10 points in 47 games) are players in their mid-20’s who haven’t made much of a contribution in Rochester, let alone caught any positive attention with opportunities in call-ups. While they have come to camp with high hopes, their chances are slim. In the off-season, they tried to improve, but not as much as the incoming younger competition. Both in the final year of their contracts, their shots at NHL careers are over. When the puck is dropped on Oct. 4 at HarborCenter for opening night against the Boston Bruins, the Sabres will be a new and younger team. Only Jason Botterill knows who will be on that night’s roster. One thing is sure; every player will have to give maximum effort, not only to challenge the opponents but to stay ahead of the competition from Rochester.